The rise of infographics across nearly all print and electronic media—from a graphic illuminating the tweets of the women of Isis to a memorable depiction of the national geography of beer—reveals patterns in our lives and the world in often startling ways. 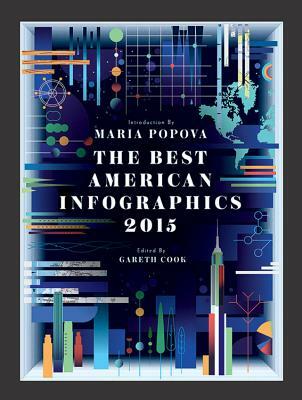 The Best American Infographics 2015 showcases visualizations from the worlds of politics, social issues, health, sports, arts and culture, and more. From an elegant graphic comparison of first sentences in classic novels to a startling illustration of the world’s deadliest animals, “You’ll come away with more than your share of . . . mind-bending moments—and a wide-ranging view of what infographics can do” (Harvard Business Review). Guest introducer MARIA POPOVA is the one-woman curation machine behind Brain Pickings, a cross-disciplinary blog showcasing content that makes people smarter. She has more than half a million monthly readers and over 480,000 Twitter followers. Popova is an MIT Futures of Entertainment Fellow and has written for the New York Times, Atlantic, Wired UK, GOOD Magazine, The Huffington Post, and the Nieman Journalism Lab. Series editor GARETH COOK is a Pulitzer Prize–winning journalist, a contributor to the New York Times Magazine, and the editor of Mind Matters, Scientific American’s neuroscience blog. He helped invent the Boston Globe’s Sunday Ideas section and served as its editor from 2007 to 2011. His work has also appeared in NewYorker.com, WIRED, Scientific American, and The Best American Science and Nature Writing. MARIA POPOVA, introducer, is the creative force behind Brainpickings.org, which receives over 1.2 million visitors a month. She was named as one of the 100 most creative people in business by Fast Company in 2012; one of Forbes’s30 under 30 as one of the most influential individuals in media; and was listed on “The 140 Best Twitter Feeds of 2012 List” by Time. Popova’s work has also been spotlighted and profiled in many prominent publications including the New York Times and Mother Jones. Series editor GARETH COOK is a Pulitzer Prize–winning journalist, a contributor to the New York Times Magazine, and the editor of Mind Matters, Scientific American's neuroscience blog. He helped invent the Boston Globe’s Sunday Ideas section and served as its editor from 2007 to 2011. His work has also appeared on NewYorker.com and in Wired, Scientific American, and The Best American Science and Nature Writing.